For week 2 we read parts 3 & 4. If you haven’t read these bits of the book then there are spoilers ahead. 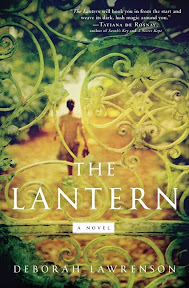 The title of this book is , and a lantern makes an appearance in both of the stories. In Benedicte’s past, it had a meaning, but what do you think the lantern signifies in her future and in Eve’s story? I’m not quite sure what to make of the lantern in Eve’s story. It has a clear purpose and meaning to Benedicte, it is love and betrayal, and everything she could have had in life and lost. But for Eve I’m not so sure. Is it just a ghostly, creepy image. I’d like to think there is more going on there, but I’m not so sure. Carl mentioned scents in last weeks questions, but they have been addressed even more in these sections. What significance do you think scents have in this story overall? Now maybe I’ve gotten used to the descriptions by now, but to be honest, I’m not noticing them quite so much. But there are still times when it pops up and makes you realise that it is important. In the story overall? I’m not so sure, are they there to evoke memories? To show us how life is different for those who cannot see? Or how something that is right there in front of us all too often goes unnoticed. What do you think of the combining storyline of Marthe? She connects Benedicte, Eve, and Rachel. What do you think will be revealed about this connection in the next sections? I really like Marthe. I think she is great character, and sparingly used to great effect. I’m not totally sure of her connection yet with Eve and Rachel. I mean I know that they were both interested in writing about her, but is that a connection> Or is it that they were all betrayed by the men they loved. As of yet I’m not sure about Dom, I think that Rachel was probably a horror to live with. That sort of personality is a form of abuse to live with. But has he betrayed Eve by not telling her all this until now? Is that lie of omission a betrayal? Or can she forigve his misguided attempts to protect her from the truth. I don’t think I could forgive something like that. It is always much better to know the worst about someone, because unless they are a serial killer, or the like, then your own imagination and worry will do a much better job of killing off any relationship than the actual truth. Now that things are beginning to move along, what do you think of the characters? Are any standing out for you? Do you particularly like any? Dislike any? Pierre. I hate him. But he really is a “bad” character. There is nothing at all to redeem him. Or at least, in Benedicte’s memories he has no redeeming features. He is nothing more than the evil bully. I’d sort of like to see a more balanced character, but I suppose in the last few pages we might get that. What do you think really happened to Marthe and Annette? What do you think the significance of the bones in the pool are to the story? Especially now that it has been revealed that Rachel is also dead. I think that Pierre murdered them and left their bodies there. Do you have any other things you think are significant to talk about? Are there any other predictions to be made for the last two sections of the book? No predictions. Part of me wants Eve and Dom to sort things out and live happily ever after, but then again, does Dom deserve that? Does Eve? I don’t know, but I’ll look forward to finding out. Lastly, what do you think of this book overall? Other than for the read-along, why are you reading it? Is it meeting your expectations? I’m really enjoying it. I only really picked it up because of the blogging recommendations, so I wasn’t expecting anything in particular. But it is a very readable and entertaining book. Pierre is pure evil. Any character that would do such things to cute little kitties does not get any of my sympathies, period. I'm hoping that what Eve is imagining of Dom is worse than the reality. You brought up a good point there, that unless he's the killer, we have no real evidence that he's done anything that bad yet aside from Eve's comment earlier in the story. I'm curious to see how his story will play out. Yeah the kitten thing was horrible. I did like these two parts so much more than the last ones. There are still things I find overdone, things I find unrealistic but all in all it is supenseful. Blending ghost story and crime works well. I didn't find Rachel all that bad but wouldn't want to live with her. She has some serious issues but so has Dom. I don't think Eve is dysfunctional, she rather seems like a woman falling in love with the wrong guy and that can really happen to all of us. She does stay quite long though. I wonder how much of Marthe is based on Helen Keller. Not that she made perfumes but her senses were so highly developped because she was blind. I too think that some aspects are overdone but that is the style of the book so I'm more than willing to go with it, and enjoy it. I'm very interested to see how the lantern itself comes into the final parts of this story. I like that it isn't something that has had much focus and yet it is such an integral and important piece of the story. I do think the scent descriptions have lessened and I think it is purposeful as we move away from Eve's story being the biggest focal point and Marthe's being more prominent in this section. Our scent descriptions now have more to do with Marthe's story and Benedicte's part in it. I liked the scent descriptions in the first sections of the book and am enjoying the role scent is playing even more in these next sections. I'm not sure how I want this book to end at this point in regards to Dom and Eve. I too wonder if either deserve a happy ending because of the way Dom treats Eve in regards to not sharing with her and the way Eve blindly clings to this seemingly doomed relationship. The romantic in me does hope for it, surely, but I wouldn't be entirely surprised if the story did not take that direction. Pierre is a good nasty character and I guess I don't mind him being so one-sided when we have all these other characters that we cannot quite get a bead on. Pierre anchors us to some degree, giving someone to suspect and to dislike while at the same time we know he cannot solely be guilty of all that is occurring in the story. This has been a great autumn read thus far and I do so look forward to finishing it and our final discussion. Very true Carl, with the story focusing on Eve it makes sense that the scents, while still important, aren't the focus of a lot of scenes. Having finished the book and figuring out how everything plays out, I am really glad that I read this. I enjoyed your answers to these questions. I just finished this today and am glad I read it too. Interesting to see what everyone thinks of part 5 & the epilogue. I'm also enjoying the book. Perfect for the fall and it is haunting and spooky enough to make me wonder what each character truly is hiding. Love this book so far and can't wait to pick it back up again to finish it!